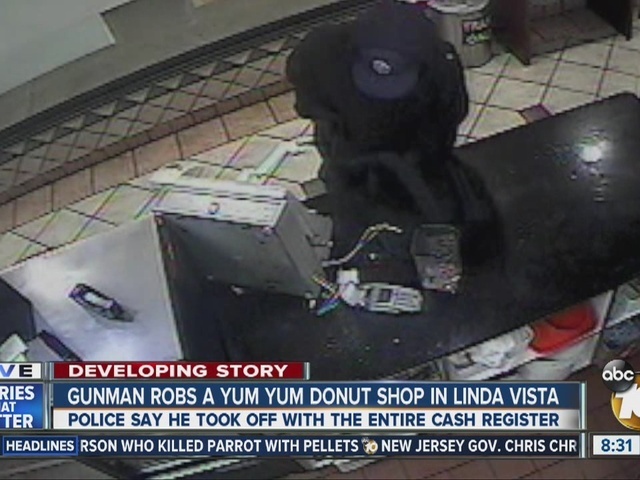 An armed robber took an unknown amount of cash from a donut shop in the Linda Vista community of San Diego. The suspect entered the Yum Yum Donut Shop, 6925 Linda Vista Road, at 4:45 a.m. Saturday, pointed a gun at the clerk and demanded money, said San Diego police Officer Frank Cali. "When he pointed the gun, I was thinking about my kids," said clerk Angel Yanez. "I got scared, ran to the back of the store," Yanez said. "He was looking at me with the gun. It was so scary man." Surveillance video shows the robber pull out possibly a knife, and cut wires connected to the cash register. The suspect took the entire register and fled on foot behind the store, Cali said. The clerk told 10News this is the second time he's been robbed. He says he was also robbed in San Ysidro in the mid-1990s. The suspect is described as a 25-year-old Latino man who was wearing a blue jacket with stripes, a blue bandana and jeans, Cali said.